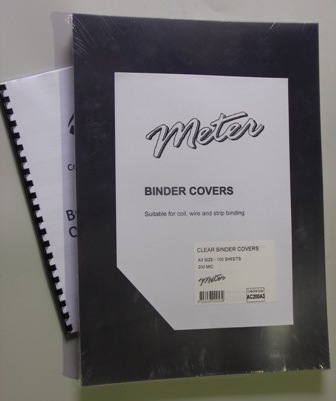 Meter stocks a large range of A3 Binding Covers that enhance the appearance of your bound documents and are a popular type of Binding Supplies. A3 Binding Covers create a professional look that stands out and grabs the reader’s attention and also protects your reports, plans and drawings. Meter A3 Binding Covers are used on the front and back of presentations. For example Clear A3 Binding Covers on the front of the document, so the book title can be seen and Leathergrain A3 Binding Covers on the back of the document. A3 Binding Covers can be used in conjunction with Comb Binding, Wire Binding, Coil Binding, Velo Binding, Strip Binding, Slide Binding and other Binding Machines. 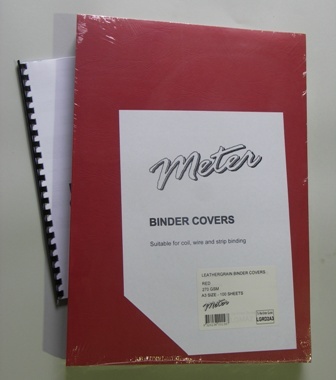 Also known as A3 Binder Covers, Meter A3 Binding Covers are manufactured from premium materials. All Covers are 297mm x 420mm in size. A4 size Binding Combs or Wires are usually inserted into the 297mm side of the A3 Cover. All Meter A3 Binding Covers come in packets of 100’s. A3 Binding Covers are available in Clear, Frosted and and Leathergrain Covers in a large range of colours including Black, White, Dark Blue, Red, Green, Maroon, Grey,and Navy Blue. The Clear A3 Binding Covers come in 200gsm and 250 gsm. The Leathergrain A3 Binding Coves are all 270gsm in weight and are made from premium quality Leathergrain Board stock. The A3 Matt Binding Covers come in a variety of colours and are 210gsm in weight. Click on the individual links below for more information and pricing on our A3 Binding Covers range.